Hobie Forums • View topic - Has anyone else purchased a 2017 Getaway? Has anyone else purchased a 2017 Getaway? Post subject: Re: Has anyone else purchased a 2017 Getaway? I leave my cat rigged all the time. So much easier. There probably won't be much performance difference. Spins work by size--the sprit (and it is sprit not sprint) spin sheets to the chainplate, right? The bowspreader spin (140 sq ft) sheets to the rear crossbeam...so foot length is similar. You do have a longer luff since you put a hound up near the top of the mast--a situation I wanted to avoid since it seemed to me reading the blog here that many who fitted the hobie 16 kit to the Getaway later had comp tip issues--might be coincidental; but ya gotta figure a comptip mast with no spreaders with a hound near the top is putting a lot of stress on the comptip joint where it meets the aluminum (on the 16, the new hound is lower down from the top, so less stress). For me, I didn't need bigger sail since I have bigger wind and would just have to dump power anyway. Related to the snuffer, the one I made is at least as reliable as the hobie snuffer. Anyway, if you are experienced or adventurous, there are alternatives than "store bought" systems. If you really want a sprit-you can buy the materials for $100 from online metals. I happen to be both experienced and adventurous and like to share my expertise with those with less experience or smaller cojones . The added stress to the comptip is a good point. Is there a way to add strength? I want to eventually add a spin kit. At some point, I'm going to add a running backstay that will only be deployed when the chute is flying. A backstay attached to the jib hound might be useful. 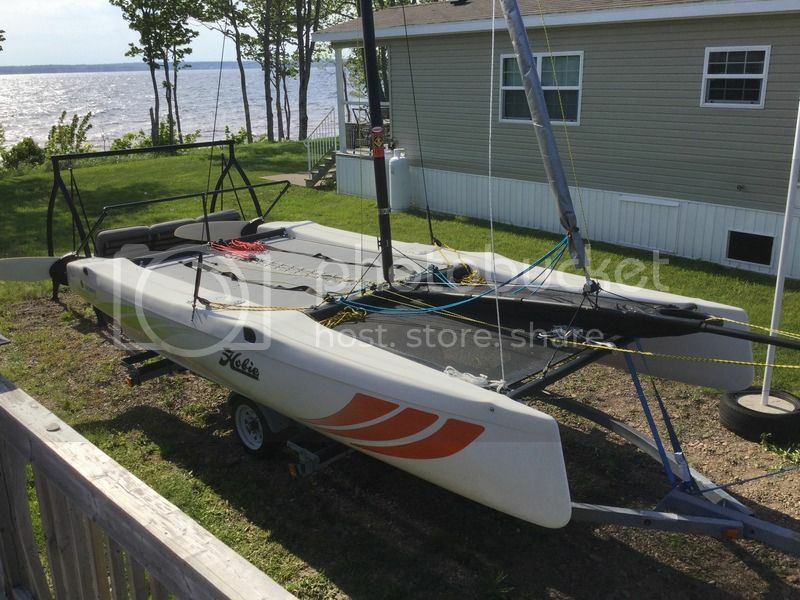 The issue to the mast with the hobie 16 kit (if there is one) is about mast flexibility IMO. The mast is designed to be a wiggle worm (which is a good thing for the normal sail suite-helps depower automatically, yadda yadda. 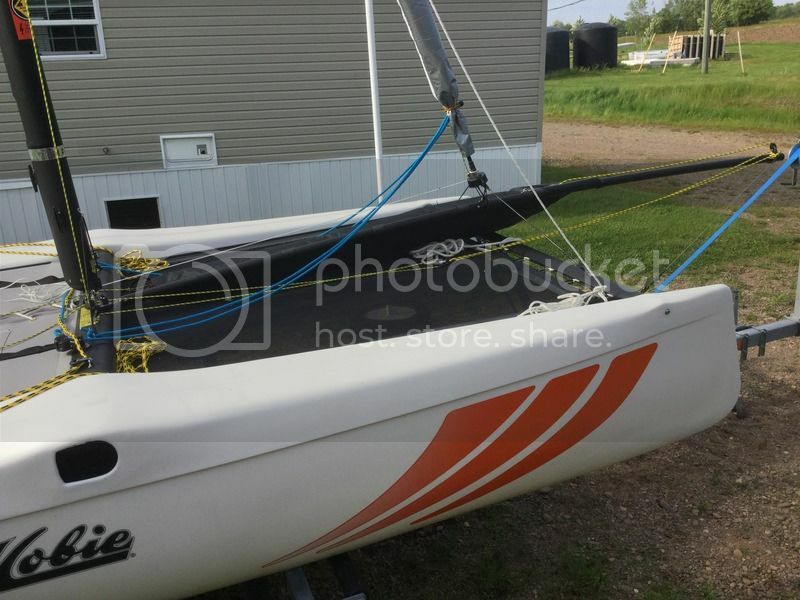 However, you've seen photos of the hobie 16 mast under spin, it turns into a big "C" bent to leeward-- the Getaway mast will do the same, but because the hound is closer to the top, the "C" may be more bent at the join between aluminum and comp. 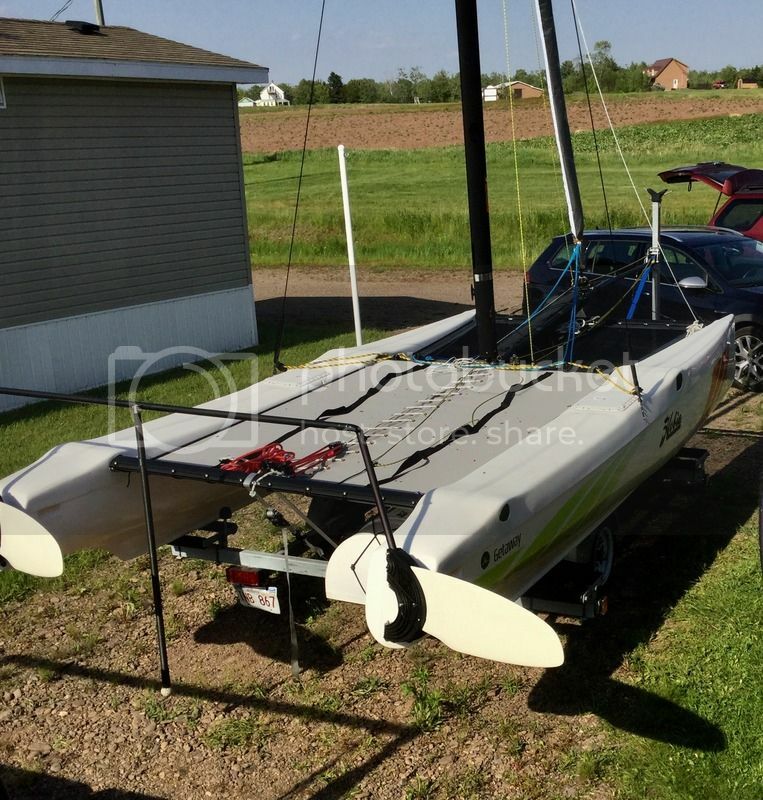 With a stay attached to the jib hound, you might be able to flatten the C.
With your new boat, though, I shouldn't worry overmuch since any failure will be obvious while under warranty. For others, you can still be safe with the Hobie 16 kit if you avoid deploying in really big breeze. If you worry, you can move your hound further down the mast and get a shorter spin luff. Lets get some pics of that new boat out on the water, with some stats, hopefully you can break the existing terminal velocity of the Getaway. I would really consider upgrading to a 2017 if I had some solid Intel on performance increases. Finally rigged and ready to rock & roll. I want to see some video of this think sailing!!! I would love to upgrade from my 2006 but need more money!! 06 getaway -- always remember, man with both feet in mouth have no leg to stand on. does it still come with wings? Wings are an available option.